Susan Utting touches on what it is to be all the women a woman is expected to be in Half the Human Race: New and Selected Poems. The experiences of daughters, schoolgirls, mothers, spinsters, widows and old crones step, leap, and charge their way from the page, retaliating against the matrix of social challenges, expectations, and disappointments that women are too often expected to meet with a demure mixture of acceptance, acquiescence, and, most importantly, silence. to my oyster satin pink instead of his red. These poems remind us how often, in the fight to avoid the male gaze, women forget to gaze upon themselves, to experience the wonder that is their own body. down; who taught me the power of hush, hush, hush. It is telling that such a simple act is worthy of comment, that it is still considered something of a defiance, a revolution, a cause for celebration. stilled themselves, quietened, fell apart. Read this collection for its imagery and its voices: defiant, determined, intimate, and fierce with life. Some readers may well have heard of this poet. I had not, and dipped a toe, an ankle, a hock into this book without reading biog or blurb. It felt seriously good, but struck an engaging range of notes: puzzling, dazzling, fun, and all too shudderingly clear. Susan Utting is not easy to sum up. The work here is a selection of previously published, going back 15 years and more, and new poems. But even within each section, variety abounds. From 2006, Wanting the Moon is a sonnet-length appeal for a full moon - "the whole of its fat face, flat/ as a tin badge with a lopsided smile." A few pages later The Sisterhood celebrates a female's cultural and physical heritage, a theme found throughout this whole compilation but certainly not overwhelming it. There are immediately appealing poems on hotels, sculptures, and something I had to look up - the art of Song Dong, writing with water on stone. Something Small is Missing is more orthodox, straight-forward, but utterly moving. It takes a good poet to do so much so well. Some poems begin out of focus, then click; Utting can be a most economical writer, then turns round and sprays us with words. "Say we're / posable, blow-up, generous, bonny, plus-size./ Say nice arse, a lovely pair." Philip Gross said she "unashamedly loves language"; Carrie Etter: "the poems return...to the thrills of being alive." With the praise of such accomplished poets, publication in TLS, The Independent, The Forward Book, and prizes from Peterloo and half a dozen other well-known competitions, Susan Utting sets a standard rarely met in the Reviews section of SOUTH. Susan Utting's new collection includes some forty new poems plus a selection from her three earlier books. There is so much here to enjoy. Just a glance at the scattering of epigraphs - references to Edward Thomas, Giacometti, Wittgenstein, Shakespeare, Soutine, Gloria Steinem, the MP Jo Cox... - gives a sense of the varied inspiration underlying a collection whose generosity - eighty poems in total - is matched by the breadth and richness of the poet's vision and by the sheer exuberance of her language. The title poem reflects the bias of the new work, which picks up and develops themes from the earlier collections relating to women's lives. Joining the ranks of striptease artist, florist's assistant, the wonderful 'Bathers of the Ladies' Pond' are the school misfits and anorexics, the scullery maid, the girls killing time at the bus stop, the woman who - rather typically of her kind - feels the need to keep saying sorry. There is a quiet feminism at work here, celebrating that female characteristic of 'managing small things', the ability to make do, to 'thrive on other people's leftovers', to be so much more than the product of men's imaginings, 'sweethearts, dolls... posable, blow-up generous... nice arse, a lovely pair', as 'Half the Human Race' concludes, with an abruptness that emphasises how much more there is to be said: '...Say we're all / of this and none of it and more, and this / is nothing like the end of it. Say'"
wings about to, struggling, to fly. her brothers' song, their call across cold air. - the dropped last line emphasising her startling transition into an alien form. Utting focuses on the minutiae of our everyday lives, at home among domestic objects and ordinary routines, but capable of imbuing the familiar with a wonderful freshness. The most ordinary events become rich and intriguing thanks to visually precise description - condensation on a windowpane, poignantly linked to her father's propensity for crying, or the experience of having one's hair washed and cut, which she links to the lightness felt at the end of an affair... And, as in 'Becoming', a dreamlike strangeness stalks a number of poems. In 'For the Punters' (from Striptease), another kind of metamorphosis occurs, in which the striptease artist begins again from naked, stripping off skin and flesh, while in 'My Mother's House' (from Houses Without Walls) the poet's mother is losing her grip on reality, a process reflected in the surreal quality of her surroundings, her wardrobe 'full of ball-gowns, / sandwiches and biscuit barrels full of instant coffee' and 'granulated sugar in her dancing shoes'. against its sting, sharp as yesterday, as sure. The American poet Mark Doty commented recently that it is easy to finish a poem too soon rather than running with an idea and seeing where it goes. Utting is never guilty of this, never short on ideas. Take the exuberant 'Self-Portrait as a Ticked Box' in which she thinks of all the colourful ways in which she could describe who she is and where she has come from rather than limiting herself to ticking a single box in a questionnaire. That said, Utting's poems are absolutely considered - down to their very sequencing - and tight as a drum. Her language is both precise and inventive, qualities reflected in a predilection for Larkinesque compounds. 'Look at her flirt in her flash-vivid bolero, / lash-flutter, hair-flick and kiss-me-soft smile' begins 'Picture of My Mother as a Young Woman' (from Fair's Fair), continuing in a giddy rush of such couplings. And the brilliance of Utting's metaphors - that owl-woman in 'Becoming', for example - is matched by the freshness of her similes: the sound of traffic 'like the smudge of downstairs / conversation after lights out', peeping Toms dropping 'like plums' out of the trees by the Ladies' Pond, an inrush of cool air into a room like 'petals fallen on dry earth, their cool / restfulness after all that blowsy flowering'. A neighbourhood pub, a visit to the hairdresser's, moisture on a windowpane, a bunch of tulips - none of these things remain ordinary in Utting's hands. Thanks to her enthusiasm for language and for life itself, for the very fabric of life, she can be trusted to tackle the most mundane subject matter and wake us up to its importance. 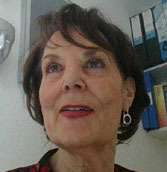 Ruth Sharman lives in Bath, where she works as a freelance editor and French translator. Her poems have appeared in various anthologies including Staple First Editions. Her Birth of the Owl Butterflies, her first full-length collection, was published by Picador. The title poem won second prize in the Arvon International Poetry Competition and also appears on one of the International Baccalaureate's English exam papers. Her second collection, Scarlet Tiger, was the winner of Templar Poetry's Straid Collection Award for 2016.